Our library was established in 1962. 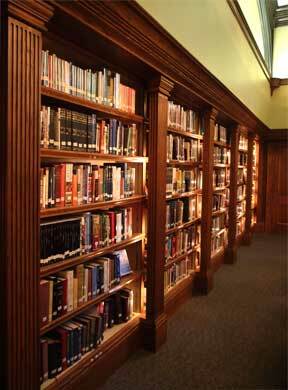 It is located on the second floor of our church building and has over 2,000 books! You can find useful study aides, personal growth books and much more. We welcome all members to make use of the library. If you have any questions about library procedures, please contact Laura Mikush. Christine Griggs Nimick was an active proponent of libraries. She was known in the community and the church for organizing volunteers. After the 1971 fire at Sewickley Academy, she organized volunteers to help restore, and then maintain, the lower and middle school library. She also organized volunteers to catalog the library of Old Economy, an old German library frozen in time from the 19th century. She got involved with our church library through Rev. Joseph Hadley, Associate Pastor, and recruited librarians and other book lovers from the congregation to make it more accessible and current. Upon her death in 1982, memorial gifts were used to renovate the Haines Children’s Chapel into the Library and Conference Center. Chris, as she was known, was married to Francis B. Nimick, Jr. in the church in 1953. Their five children were baptized and confirmed in the congregation. She was also active in organizing the Flower Committee with Dorothy Ferguson and Ann Genter, with training from the National Cathedral, and in the prison ministry in the Western State Penitentiary, organized by Pastor Rev. Dr. George Wirth and Dr. Herb Thomas.